I was recently contacted by the lovely people at me&i to do a review of there clothing for them, by which I was thrilled. me&i produce lovely Organic clothing which is very eye catching and bright. me&i started back in 2004 by Susan Engvall and Helene Nyrell, working from their homes in Barsebäck, Sweden. The company began when Susan and Helene couldn't find high-quality childrens clothes which were 'cool' as the ranges were very limited. Susan and Helene then joined with Camilla Blom Polfeldt, an art director and print designer and they started to design their first me&i collection which became a huge sucess. Still based in Sweden, me&i has 750 sales staff working in Finland, Norway, Germany and the UK to advertise the me&i brand. Having a boy sometimes the only option for clothing is standard jeans and a variety of t-shirts, luckily this is slowly improving however nothing seems to be bright. I love to dress Jack in bright clothing which are unique designs and not something you see very often. When looking on the website for me&i there was so much choice and I would have been happy with any design which was sent. 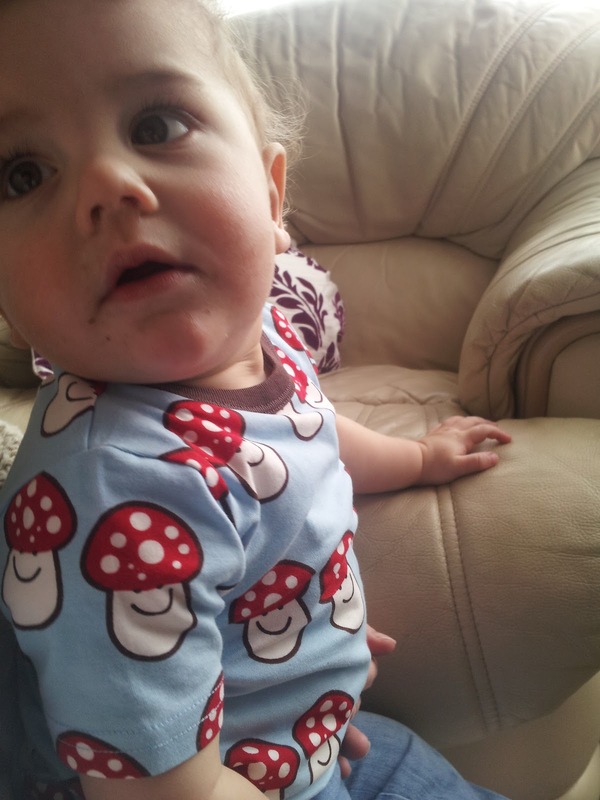 Jack was sent a 'Happy Mushrooms' short sleeved t-shirt which is suitable for either gender. 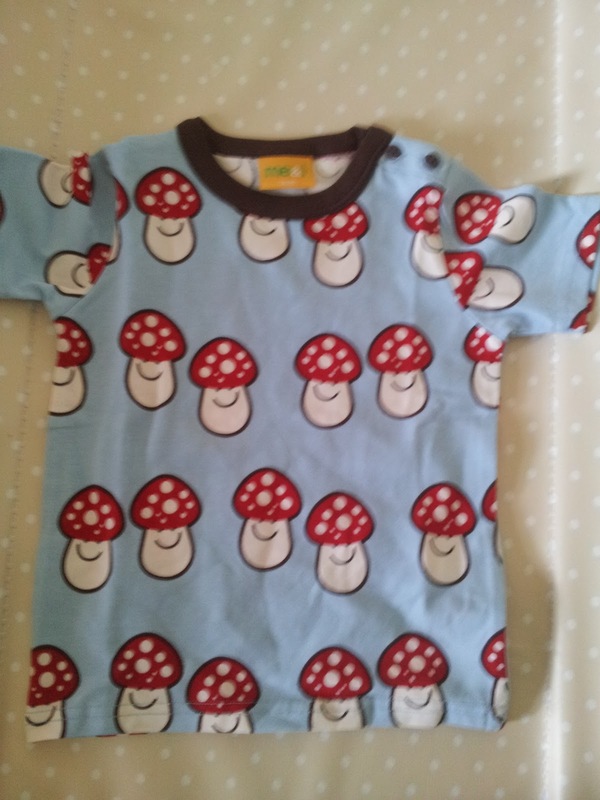 It is a light blue top covered in red and white mushrooms. It is a really fun design and we have had a lot of happy comments about it (which I didn't expect). The top is 95% cotton and 5% elastane, and the quality feels amazing. 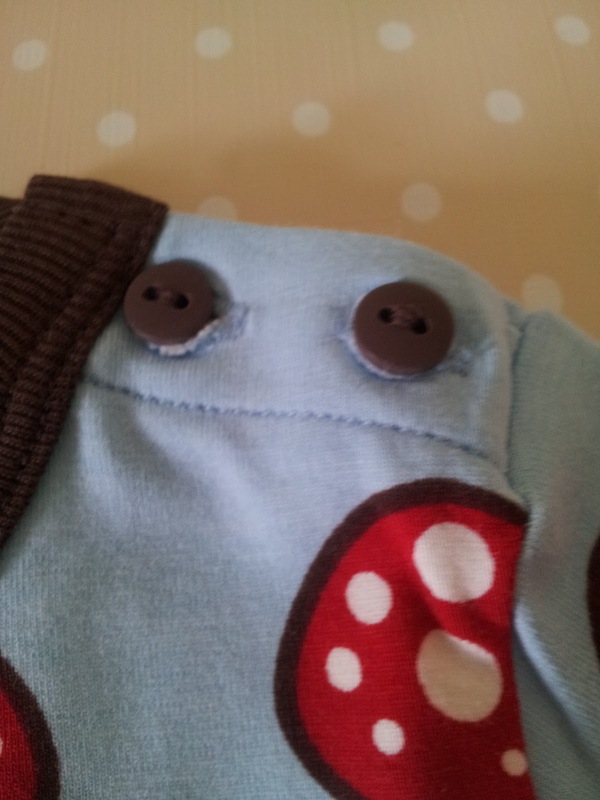 The top is very soft on Jack's skin which is always a great thing with baby clothing. The t-shirt has two small buttons on the shoulder to allow for easy removable and placing of the t-shirt, these fit the design perfectly. me&i use there own clothing sizes being a Swedish company so it is important to order their sizes. Jack would normally wear a 9-12 months top but according to me&i website he would be ok with 6-12 months. I was a little worried this would end up coming up small however, when it arrived it was a perfect fit, not only that after washing it is still a great fit. Due to the elastane in the t-shirt I feel it will last Jack a while, whilst still also being comfortable and great looking. When your child grows so quickly it is always good to know you will get great use out of the items you buy. 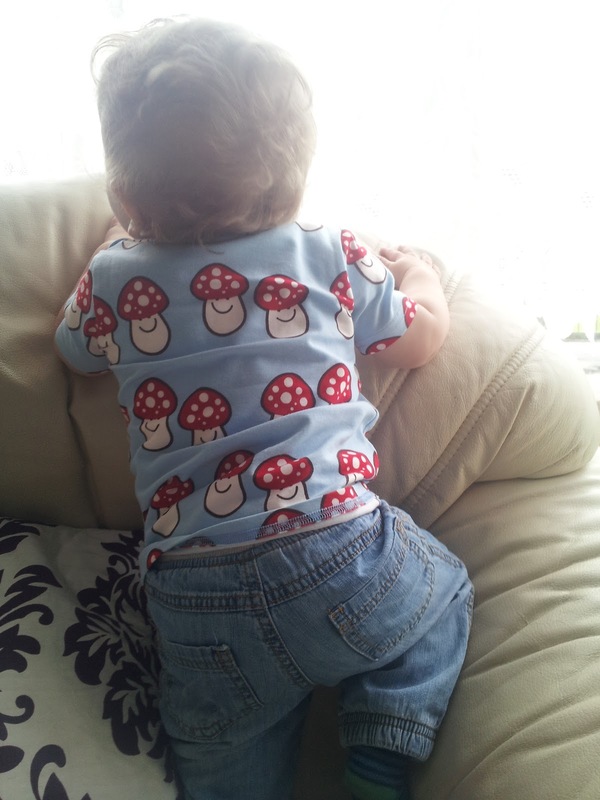 The 'Happy Mushrooms' t-shirt ranges from £15.00 - £17.00 depending upon sizing. Although this may seem a little expensive for a t-shirt, you take into account the quality of the fabrics and how long it will last. me&i are on the lookout for enthusiastic individuals who love their clothing to become part of their team. For more information on this please take a look at the me&i website. Please Note. This product was sent to me byme&i for the purpose of this review, all opinions and wording are my own. That is a gorgeous t-shirt, I love it! So colourful and bright.